I’m ever so slightly wary this is going to come across as slightly melodramatic and self-pitying, but those who know me well will know that’s just about usual. It’s been a busy few weeks. I’ve been more caught up with the chaos of the festival than usual (despite not actually doing a show myself, or at least not one that involves any sort of organisation), and to add to that I’ve been very much caught up in trying to make sure Hanover Day takes place this year. Much as I love that sort of chaos, lately I’ve been making lists of what I’m going to do when it’s all over. Well, that and one afternoon of curling up into a foetal position and freaking the hell out. So, anyway, here’s my list of things to do once all the chaos dies down. – finish putting together my second book of poems. This was actually 85% done about six months ago. I (self) published the first book (City Boy in Blind Spot Trauma) back in 2007, and I’ve easily got enough material for a second one. However, since I put the line-up together back in November, I’ve changed my mind massively about what bits I actually want to include. And then I’ve got to lay it out, and get people to draw illustrations, and then actually bring myself to like it enough to get it printed up and have a book launch and all that. At the moment it’s called The Holy Roman Empire vs H & H Fried Chicken and Kebabs, but this could all change. For want of an infinitely better title. Me and Amy made Glossy Magazine last winter. It’s a bit like the sort of magazine you might get with the Sunday papers, but smaller, and better, and with more lies in it. Again, we’ve got a lot of the content – I just need to get round to laying out a load of pages on photoshop. And, um, that’s about it. Or at least shave the back of it again. It’s full of little tangled dreadlocks and it weighs a ton. No undercuts. No real plans. I quite like the idea of a grand tour of the UK. I’ll probably just go hang out in St. Albans for the weekend. Amy’s not coming back to Brighton any time fast. I miss Glue Gun ’91. I’d like to write an illustrated history of St. Albans and organise a Dining Experience. This is, as ever, a very incomplete list. But it’s nice to think about the future, especially if you’re lying in a foetal position mid-afternoon and freaking the hell out. … someone has to keep the records. it’s difficult probably impossible to actually document this month in any sort of coherent way as so much has happened mostly with the festival but some other things as well and any sort of chronology has been lost so here once again are i guess a series of glimses always May i try to run around and see as much of the festival as possible but some kind of (not malaise – I think i mean the event equivelent of audioamnesia – when you walk into a record shop and are instanly overwhelmed by the sheer choice and forget what you’re looking for in the first place) almost freezing up at the list of things that are going on, but I managed to make it to some things anyway and this i guess is some kind of loose description of what they were as well as possibly some kind of explaination to my friends as to where i’ve been for the last month. anyway and then we went to the star and got some curry and then came home and then on monday we went to see spacedog perform televisor which was absolutely incredible – we saw them do the uncanny valley at the marlborough last year (although possibly the most uncanny bit was the fact that me and amy were thinking of doing an uncanny show at the same venue on pretty much the same date and called up tarik and he thought there must be some kind of ‘uncanny valley scene’ – maybe there is, although i imagine it’s pretty small) but anyway the show was awesome they had delightful and creepy singing robots and a singing crow and a electronic belltower and an actual televisor and this brilliant percussionist and sarah angliss was playing her theremin and professor elemental was growling about carnivorous toys – it was a beautiful and unsettling evening. Seriously, Sarah Angliss and spacedog deserve recognition as one of the most unique musical acts I’ve ever come across. Link! and then on tuesday went out with the fringe cru to the pop-up restaurant at city college which was a delightful if also quite bizarre experience -it’s all in 70’s style and decor and they gave us incredible cocktails (i’m now a massive sucker for anything full of gin and vermouth and campari – more so than usual) and the food was incredible and what’s also quite funny is the fact that as they’re all catering students they’re all really young so it was slightly like being in a five star restaurant but being served by children (not actual children. perhaps i’m just getting old) but it was loads of incredible food for bargain prices and my main regret is that i didn’t get the baked alaska because i was a bit overwhelmed by the sheer amount of food we’d been given by that point and ‘plumped’ for the fruit sorbet and then the next day we went to the woods at the komedia and they were supposed to have filled the top room with trees and there werent as many trees as perhaps there could have been but it still looked pretty good and there was a giant creature made out of foam wandering about and a big chair in the middle where a guy was telling stories and then the moulettes came on who were incredible prog-folk with violins and cello (girls! strings!) and then the other band came on after them but i wasn’t really into them as much but it was worth it just for the moulettes and then on thursday i think i just stared into space and passed out early and then on friday popped down to see the brand new victorian gin carriage in jubilee square and sat in the sun for a bit and swapped a story for a glass of gin and then went back to the office and then headed off again to just catch the dog eared collective who were very enthusiastic and had some great sketches (i was a bit of a sucker for the one about the superhero who stands up for the rights of short people, but maybe I’m biased) and then james had given me the first draft of his book ‘clown stories volume 1’ which has got a couple of stories and a poem that I’ve written in it so I sat on the beach after work and drank a beer and read some clown stories and then ran up the hill for a quick pint with anna and then went on down to the gin carriage for their launch which was ridiculous as they just handed us obscene quantities of gin which was incredible but then we went to the former hectors house to go see king porter stomp but by then i was thoroughly confused and vicky bought me a bottle of newky brown but then i think i just went to sleep outside and the next thing i knew was a load of teenagers were shouting “oi! pinstripe! wake up!” and i woke up and realised I was thoroughly befuddled so wandered back home and bought a block of cheese on the way home some of which i ate. and then the next day i woke up a bit confused but i had to go read some poems inside petrusco’s giant scuplture of his own head on new road so went on down and actually it turned out i was standing on a stool in front of the giant head and i’ve had some bad esperiences reading poetry standing on stools (once had to be rescued from a load of angry football fans in the victory by a bouncer, and the aforementioned ‘freddie mercury’ incident) but it actually went really well and i even managed to drown out michael jackson which is always a difficult task and a few people were videoing it so there’ll probably be footage of me looking red-faced and deranged standing on a stool on youtube before long and then met up with anna and her mum and dad who whisked us out to terre a terre (well decadent) and we ate all sorts of incredible gourmet food and then went off to the balkan brass explosion at the dome which was something else – if serbia is like that all the time then i really want to go. there were a load of older experienced brass musicians on the left and a load of younger more entheusiastic brass & percussion musicians on the right and they took turns to play incredible gypsy brass music whilst Marko Marcovic bounced about flailing his trumpet like a loon. and then at the end they all teamed up to make a massive brass supergroup. they played for hours and it was totally awesome and has reignited my desire to go to the serbian trumpet festival. one day, perhaps, one day. and that brings us up to today and i’ve got to go host a poetry event in the gin carriage in a couple of hours and go and rescue my bell. it’s been a long month. no rest for the wicked. Hey, I never said it was going to be chronological. Setting off on the evening of Maundy Thursday to celebrate a long history of traditions. I’m not sure where the compulsion to repeat comes from (Beyond the Pleasure Principle, perhaps), but it’s definately strong. And so, as the tradition befits, I set off back to St. Albans for the annual Good Good Friday Agreement. This is something we’ve done every Good Friday for the last nine years, when we did it accidentally. St. Albans is a beautiful place, but I don’t think I’d really want to live there any more. I spent the first nineteen years of my life in the fair cathedral city of STA, and I don’t think I could move back without shifting into some kind of creepy echo of my teenage self, but visiting it is always a rare and special delight. Each location is marked with memories, and sometimes you can turn a corner and be hit with nostalgia in the small of your back and have to stop for a moment to catch your breath. I’d really like to write about St. Albans, some kind of guide book mixed with a blend of personal mythology and misleading information, but it’s difficult to work out even how I’m going to start. Anyway, the first ever Good Good Friday happened by chance, but now it’s a regular fixture. Essentially, it’s nothing too radical – me, along with about eleven or so people that I went to school with back in St. Albans, plus associated hangers on and fellow Albanians, meet up (supposedly at the strike of twelve from the Clock Tower, although it’s a vaguely relaxed start). A lot of the day involves going to the pub. Nicky P pointed out on Good Friday that both of our reunions happen to fall on religious holidays (we also see each other on Christmas Eve Eve), but that might be a mix of coincidence and convenience rather than adherence to the religious calendar. I probably don’t need to go into too much detail about what we actually did on Good Good Friday – we went to various pubs, we strolled through St. Albans, we got drunk, and caught up on various aspects of what we’d been doing. The thing that really surprises me is that even though only two of us actually live in St. Albans, all twelve still manage to see each other with extraordinary regularity, at least twice a year, despite living as far afield as Frankfurt and Bradford. I’m impressed. Even though I can’t really remember the last hour and a half of the day very well, still. I’m impressed. 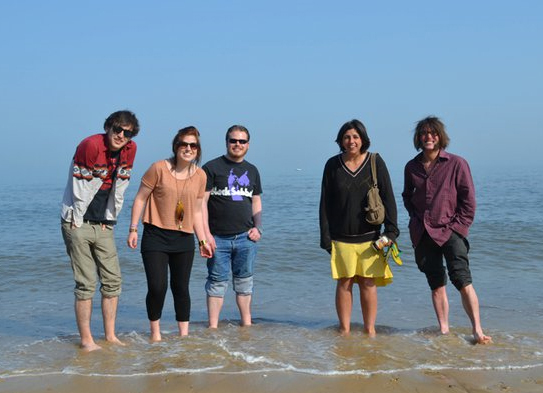 And the next morning, I set off with my family to Southwold. If it’s the ninth annual Good Good Friday, it’s at least my thirtieth visit to Southwold. Seriously. It sometimes alarms me how much of a creature of habit I am. If St. Albans is a cathedral city turned suburban commuter town, then Southwold is a pretty seaside town turned middle class weekend break venue. It’s where Gordon Brown (reluctantly) went on holiday in 2009. It’s full of gorse, pink houses, cannons, lighthouses, and (increasingly) shops that’ll sell you a £12 tub of olives. Every year, my immediate family and selected members of my extended family converge in Suffolk for a reunion that’s not incredibly different from the one described above. I think that’s what gives a bit of sparkle to the regularity, what lifts it above Larkin’s dreary “plugging at the four aways” (and Christmas at his sister’s house in Stoke). There’s a joyful circular pattern to it, even if each year you find that another bit of the sandstone cliffs has fallen into the sea, that the lovely little bookshop is now a twee craft emporium selling lighthouse crockery, that the wood-timbered local full of fishermen and florid landlord now has a marble bar, white walls and roars of polo-shirts from the Home Counties. Time passes. And yet in these home-made rituals, re-treading our footsteps again each year, the events become weighted and filled with meaning. And that’s something special. But you won’t catch me buying the £12 olives any time soon. It’s been a long time since I’ve got home at half past seven in the morning. Even back in the days when this was a more frequent occurance, I’ve never really been one of those people who can stay up all night without sketching and/or passing out. However, it was at around half past seven that we trudged down Lewes Road in the sunshine this morning, after an eventful and fantastic night. 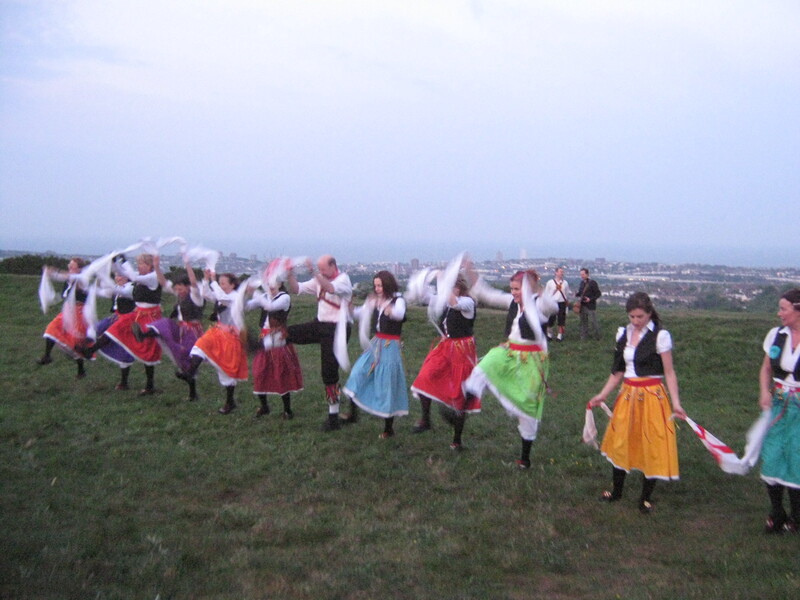 Every year, on the eve of May 1st, Brighton Morris Men and Cuckoos Nest Morris have a big dance-off outside the Sir Charles Tapir, stay up all night, and then dance in the dawn up at Hollingbury Hill Fort. We managed to get up there and watch them about five years ago, but haven’t made it since. We’re definately big fans of the Morris (excellent stick-work), although as Tom points out, they are “coarse coarse men”, and there’s nothing like watching people leap through the air with bells on their ankles, clashing sticks together and singing. The dance up at the Hill Fort is something very special, though, and we really had no excuse not to go along this year, as May 1st fell on a Sunday (although I’ve got vague memories about making it to work the next morning last time we went), and we were going to drive up there in Anna’s van. Until about two days before, when Anna got a text from Gee which indicated that I was actually performing at the Cowley Club that evening. I can’t actually remember agreeing to do the gig, but it was definately worth doing. Petrusco was organising it in order to raise money to transport a gigantic model of his own head (which has an art gallery inside) to a festival in Spain. At least, I think that’s what it was in aid of. Either way, it went well, although I did have to leap up on a chair halfway through (wary of repeating the “I feel like Freddie Mercury!” incident which resulted in me crashing down on top of a drumkit and a load of guitar pedals at the Hope a few years ago). Petrusco kept handing me bottles of cider, and I don’t think I accidentally insulted anyone at the Cowley Club with what could be construed as a slightly cynical take on political poetry and conspiracy theories. Afterwards, AK/DK were playing, who are one of my favourite Brighton bands of all time, and I got to sing with them for a song, which was great. They’re a double-drum-double-synth duo, and hopefully managed to put up with me shrieking about canapes and water and rats over the top of them for a while. By about half past one in the morning, I was beginning to fall asleep where I was sitting, but although slightly tipsy, we thought we’d have a go at making it up to the Hill Fort to watch the Morris. However, we didn’t really want to find outselves wandering around a dark and cold hill fort with two hours to kill before the Morris started, so we went to the legendary All Night Diner. The All Night Diner is an incredible place. I have no idea what it’s like during the day, but at 2am on a Saturday night it’s filled with wild-eyed drug fiends, crazy people, drunk people, late-night fry-up seekers – all in all, a fairly representative sample of the confused and hungry population of Brighton at this stage in the evening. They’ve got an incredible wood carving on the wall which depicts an enormous breakfast made out of different kinds of wood. When Nicky P used to live in Brighton, he used to go to the Diner with his heavy metal housemates after the Gloucester or the Pav Tav. They would order a gutbuster, which is essentially an enormous breakfast, and Nick would order a megabuster, which is two gutbusters on top of each other but with extra fried bread and a cup of tea. One night he couldn’t finish his megabuster, and that was when he knew he had to leave Brighton and seek his fortune further north. Anyway, I digress. Me, Anna and Emma-Jane didn’t order any of these giant breakfast monstrosities, but much lighter snacks of the egg&chips / sandwich mould, as well as tea. Although E-J bumped into a friend in there who gave us a whole black pudding, which we then sent home for Jed. After a bit of sitting around in the Diner, finally it was time to start walking to the Hill Fort. We bought a wee bottle of whisky and some kind of weird flat rolled up pizza thing that was on offer in Easy Hours, and set off up the hill. Essentially it’s just one really long road which goes all the way to the Hill Fort, and it was nearing 4 o clock when we got there. It’s quite confusing to find your way to an actual hill fort in the dark, and Anna nearly led us straight into a really tall hedge, but eventually we spotted a light in the distance. 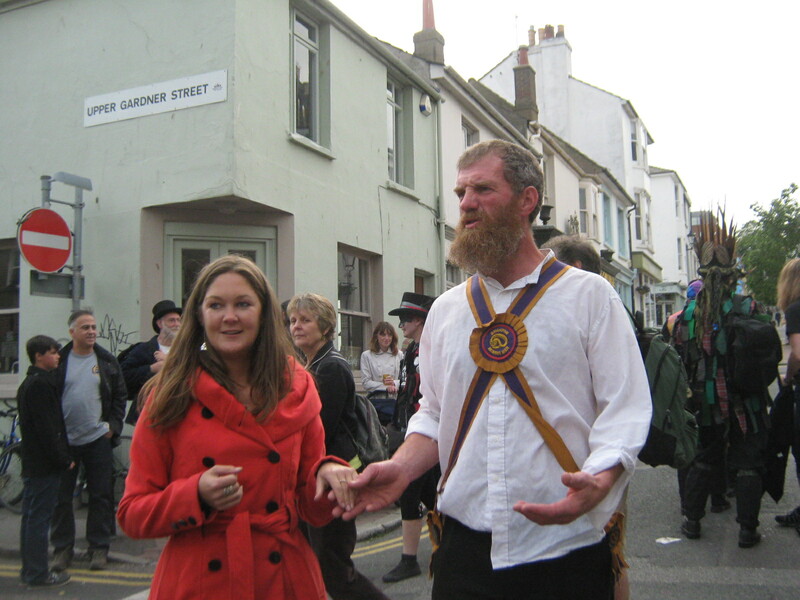 Making for it, we discovered a lost and confused Morris Dancer. Gradually we found a couple more, and suddenly the hill was full of Morris dancers. At first, we thought we were going to be the only non-Morris there, but other people turned up, including a few surprised dog walkers and other early-morning strollers. And then they danced. The musicians began to play, sticks were clashed, and gradually the whole place became light. It’s a really beautiful and magical sight watching morris dancers dance the sun up, even though they’d been up all night and a few of them were really really drunk; “My bells! I’ve lost my bells!”. It’s quite hard to describe exactly what made it so special, but I can’t imagine a better way to celebrate the coming of May and of Summer. 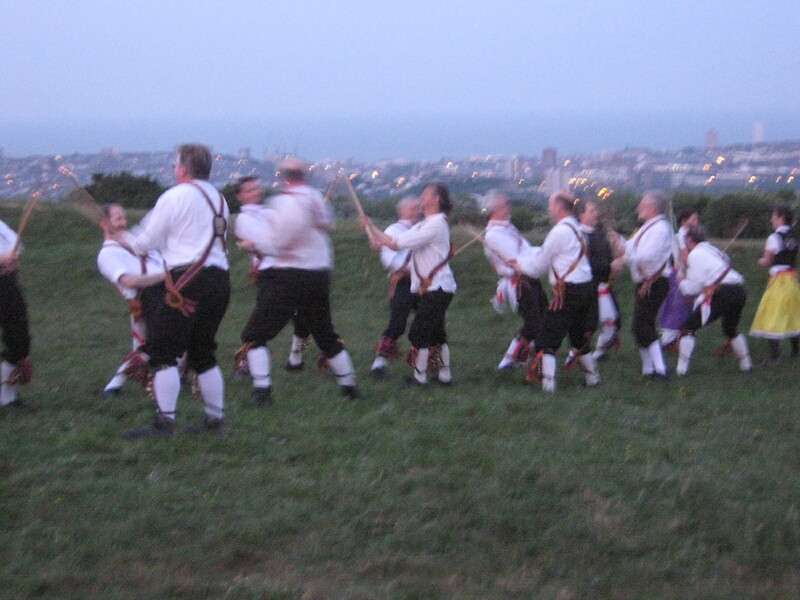 After the dance, when the sun was over the horizon, we all paraded around the edge of the hill-fort, surrounded by morris dancers and accompanied by the band, all at an incredibly speedy pace. Then they returned to the start and all sang, before heading back to town to (presumably) either go to bed or have breakfast. We wandered down over the golf course, sat in the sun for a bit, ate the big funny flat-rolled pizza, finished the whisky, got sprayed by an intermittent green-sprinkler, and made our way slowly back into town.